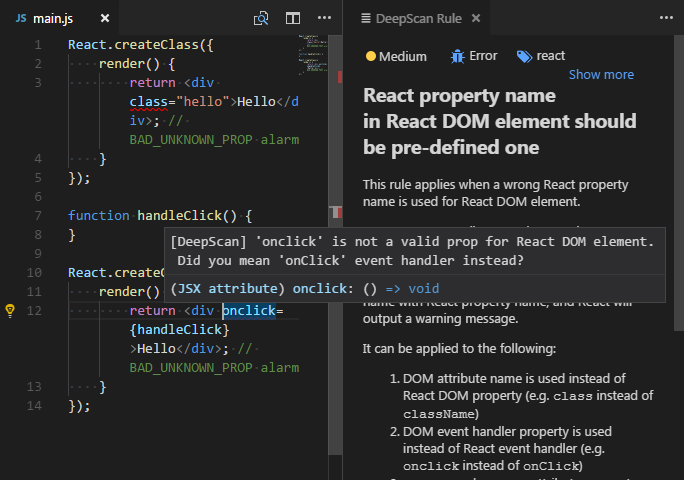 Visual Studio Code>Linters>DeepScanNew to Visual Studio Code? Get it now. Note: To use this extension, you should confirm that your code is transferred to the DeepScan server for inspection when you save your changes. You can confirm it by pressing the Confirm button that appears when restarting VS Code after the installation. Note that your code is completely deleted from the server right after the inspection. Report issues in Problems panel when you open a *.js, *.jsx, *.mjs, *.ts, *.tsx, and *.vue file and save it. Show a rule description using a code action. When you click the light bulb of the issue, you can see the detailed description of the rule and grasp what's the problem. deepscan.enable: enable/disable DeepScan. Disabled by default. Enabled on per workspace when you confirm. deepscan.server: set an url of DeepScan server. "https://deepscan.io" by default. deepscan.proxy: set an url of proxy server. When you are behind a proxy. deepscan.showDecorators: enable/disable to show high and medium problems with inline decorators. Enabled by default. While you can exclude rules project wide via deepscan.ignoreRules option, you can also disable a rule in a file using inline comment. By Ignore this line and Ignore this rule code actions, you can add an inline comment easier. never worry about transferring the code outside. analyze a whole project rather than a file. To activate this, contact us at support@deepscan.io. In the embedded mode, this extension contributes the following commands to the Command palette. Inspect Project: inspect the current project. Clear Project Problems: clear inspected problems. This extension requires a connection with the DeepScan server for inspection. This connection cannot be established when you are behind a proxy. For this case, the extension will try to set its proxy via your http_proxy environment variable. If you don't have the environment variable, try to set deepscan.proxy option to the url of proxy server.